When it arrives on Nov. 12, Disney+ subscribers who pay the $6.99 per month, or $69.99 a year, entry fee will gain commercial-free streaming access to Disney's entire catalog, including classic films from the so-called "Disney Vault." The company struck deals to bring the service to streaming hardware manufactured by Roku and Sony, and executives expect it to be available on smart TVs, set-top boxes, tablets, compatible PlayStation consoles and other platforms at launch, reports Reuters. 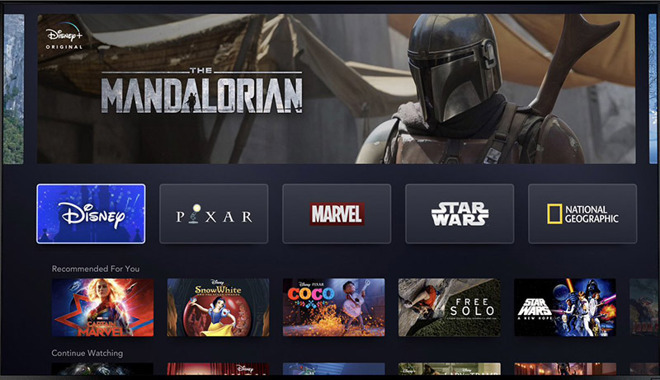 Along with web browser access, mobile devices are covered by the Disney+ app, a screenshot of which was teased in a tweet from CEO Bob Iger. The card-based interface appears to be a riff on existing UIs in use by Apple, Netflix and Amazon, with large feature slots positioned at the top. Users will be able to browse content by production house and franchise — Disney, Pixar, Marvel Universe, Star Wars and National Geographic were shown in the screenshot — as well as system recommendations. While not displayed in the image shared by Iger, Disney+ incorporates big-name movies and shows from Disney's recent $70 billion acquisition of 21st Century Fox. Disney's direct-to-consumer division chairman Kevin Mayer said Disney will "likely" offer discounted bundle packages for ESPN+ and Hulu, reports Fast Company, but the executive fell short of committing to the strategy. Currently, subscriptions to ESPN+ and Hulu, of which Disney owns a controlling share, start at $4.99 and $5.99 per month, respectively. As previously reported, Disney is working on a slate of straight-to-streaming original shows to drive interest in the fledgling service. The studio previously announced plans to build on its Marvel and Star Wars properties as part of the push into streaming content, including "Rogue One" prequel "The Mandalorian" and a series focusing on Marvel villain Loki. While some new movies, like the upcoming "Lady and the Tramp" remake, will land on Disney+ at release, most will be windowed until after they cycle out of theaters and a home video sales period, the report said. The service goes live on Nov. 12 in a number of major markets and will land in Europe and Asia next year. Disney expects Disney+ to have between 60 million and 90 million subscribers by 2024. Disney's push into streaming arrives as other major industry players and newcomers enter the lucrative market. AT&T's WarnerMedia is planning a late-2019 launch of its effort, which hosts content from HBO, Turner, and Warner Bros. Apple, which has for years hosted third-party streaming services on its Apple TV set-top box, is entering the fray with its own branded subscription offering. Announced at a special event in March, Apple TV+ debuts this fall with a host of original content from acclaimed Hollywood directors, producers and actors. Apple during the keynote trotted out A-list partners like Steven Spielberg, J.J. Abrams, Oprah Winfrey, Reese Witherspoon, Jennifer Aniston, Steve Carell, Jason Momoa and more, who presented a look at their forthcoming projects. Apple TV+ will be available in Apple's revamped TV app, which landed in developer hands with the release of the iOS 12.3 and tvOS 12.3 betas last month. Apple is looking to expanding its reach beyond Apple TV hardware, and plans to make the TV app available to third-party TV and streaming device makers this spring.